If you weren't at the Barclays Center for Carnival Mania Saturday night, you missed an epic show! Grenada's Tallpree, St. Vincent's Skinny Fabulous, Barbados' Edwin Yearwood and Alison Hinds, and of course, Trinidad and Tobago's Bunji Garlin and Fay-Ann Lyons! You know with that kind of lineup that DysChick had to be there. Not just be there, but be front and center. Thanks to an invite from the Queen of Caribbean News & Entertainment JayBlessed, DyChick not only got to enjoy the stage show but I had an opportunity to talk to the artists behind the scenes! When rumors of the New Jersey Nets coming to Brooklyn began, many people were excited. My first thought, however, was where they would put the stadium. It was decided that the heart of Downtown Brooklyn would be the location for the building, I thought of how this would impact Brooklyn residents. The traffic caused by taxis picking up around the stadium, the tourists flooding the streets after sporting events, and the cost of everything in the area going up. There is, however, an effort to appeal to Brooklynites with events that celebrated Brooklyn: Jay-Z's free concert, Brooklyn Hoops, and the three-day Carnival Fever Irie Jamboree Music Festival, which took place over Labor Day weekend. As a fete specialist, I usually show up to nightclubs, warehouses, and backyards with flag in hand, ready to get on bad with my West Indian massive. This time, my pace was different. I was invited to the Barclays Center to attend the show as press! With the other press personalities, I waited in line to get my VIP wristband. Having never been to the stadium, I was excited to get to be at the front of the stage, waving my rag, and taking amazing photos of the show. It did not occur to me that I would actually get to talk to the soca artists that I have come to love...and, in some cases, stalk. While waiting in the lounge backstage for our interview time, I got to meet and talk to two fabulous lady bloggers: SocaMom, who provides resources and advice to Caribbean parents to her fans, and RACA, a Guyanese-American (big up GT massive!) who looks at West Indian events "for all those living that hyphen life." These two women had me cracking up with laughter, which calmed my nerves and allowed me to prepare for my interviews. The amazingly talented and so humble Edwin Yearwood was my very first interview. No pressure. I was just about to talk to the man whose voice I've heard pumping through my stereo at home all of your life. My first thought was simply to talk about that music, that voice, and his inspiration behind one of my favorite tunes, "Sak Passe." The song originated when he was in Antigua with fellow Bajan crooner, Rupee. After hearing the phrase many times on the road, Yearwood informed his friend that, if he did not create the song within two years, he would. The timing was perfect as he felt that Haiti needed to be represented as the country dealt with economic crisis and political corruption. The dance that accompanies the song is a simple two-step that allows large groups of people to simply sway together in time to the song. "It's about unity and togetherness. That's what I'm about." The rest, as they say, is history. Krosfyah has performed the song many times and has had crowds all around the world dancing along. In complete contrast to his Bajan comrade, Skinny Fabulous is known for his aggressive tunes like "Duracell" and "Hurricane." The Vincentian artist is clear about how his music is different to many others. "My music makes you paranoid!" The songs attempt to convey the energy, the passion, and the madness that is associated with the style of partying that is common on his island, a style I was told should make the stush and proper be very afraid. There is no two-stepping, not even to his allegedly groovy song "Rave Out." As it is now on my workout playlist, I had to find out how his latest release "The General" came about. It is not an obvious moniker for the 135-pound Vincentian so I wanted to find out why he would give himself that title. "I was ordained The General," says Skinny. That seems fitting as I have witnessed how Skinny Fabulous can command a crowd to mash up everything or to simply jump on the spot. 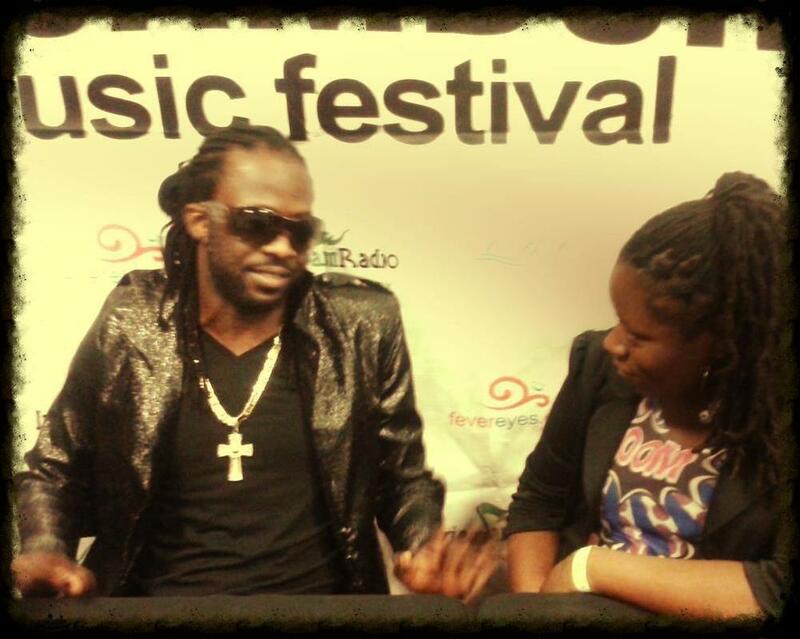 It is this authority in his music that won him the 2013 Vincy Soca Monarch and Road March competitions. I was completely satisfied with having the chance to do two interviews. My mind was racing and I was excited to go out and see the show. Before I could untie my flag from my belt loop, in walked Soca Royalty and my favorite soca stars, Bunji Garlin and Fay-Ann Lyons! I almost fainted. I literally had to take a few breaths and calm the 13-year-old-Justin-Bieber-fan-type of screams bubbling inside of me. If you have been following me online, you know that I love to see Fay-Ann Lyons perform because of the way she encourages crowd participation. Hmm. That is an understatement. She encourages the crowd to run around the venue, compete with fellow patrons for title of "best side," and to bounce into one another - all without fighting. I had to find out the method to this madness. "That's the way we partied when my dad was singing." I doubt, however, that her dad would have jumped off the stage into a large sheet and being flung into the air by fans. So, if you are heading to a Fay-Ann show, be sure to wear your flat shoes, walk with your rag, and be prepared for a workout. Although she can absolutely hold her own in the soca industry, Fay-Ann supports and even serves as inspiration to her husband, Bunji Garlin. His music took a turn this year with his instant hit "Differentology." He stated that this song had been in him for a while, but in trying to appease people who wanted to hear a specific sound and style, he buried it. However, upon receiving encouragement from his wife, Garlin decided that this year would be when he would release the music that was true to him and not just provide the world with what they thought they wanted to hear from him. He continued to surprise fans with "Savages," coining the term anti-stush and "Carnival Tabanca," which explains the delusions of a man severely missing carnival. Garlin says that he will continue to surprise people as he incorporates sounds and styles from around the world. He has faith that fans will appreciate this as he hopes to bring soca to more world stages. With his latest achievement in the music industry, taking soca to the world may get a little easier. Last month Twitter, Instagram, and FaceBook reacted to the announcement that VP Records signed Garlin to their label. "While the world is spinning in doubt, if you truly believe in yourself, great things will come your way." Congratulations to The Viking! After gushing over the artists backstage, I headed out to the auditorium to see soca's Royal Couple perform. My first impression, the stage is amazing! The lighting is perfect for showcasing the singers and the bands. This location is fantastic for live performances. No wonder the MTV Video Music Awards used the venue for their show. But how does a posh venue like the Barclays Center accommodate a group of people known to mash up, jump up, and bounce around during a soca performance? Well, it really doesn't. See more videos from this and other events on my YouTube Channel. The down side to being in a stadium is stadium seating. The distribution of the crowd made the event look sparse. Everyone was finally asked to come down to the floor level of the stadium just before Bunji & Fay-Ann came on stage. I believe that this is how future shows at the stadium should be arranged. When you have artists that look forward to crowd participation and strive to build unity by having people interact with each other at events, it is crucial that the audience be allowed to mingle in front of the stage. How else is Edwin Yearwood going to get us all to dance the Sak Passe? How is Skinny Fabulous going to get his fans to cause a mad hurricane? And how would Bunji & Fay-Ann find out which side is the more energetic side? I would love to see more Caribbean events at the Barclays Center. I would love to see the energy that these artists bring to other venues supported by the Barclays Center with standing-room only tickets and a setup that suits the way we fete. Since the stadium is in the heart of Brooklyn and encourages Brooklyn residents to attend events there, wouldn't it make sense to support the borough that hosts the West Indian American Day Carnival, the largest parade in New York? That being said, kudos to Caribbean Fever for securing this venue for an entire weekend of Caribbean entertainment. It is about time our culture took center stage.